Celebrating Mardi Gras with these great books! These local authors have made tremendous contributions to books and music that celebrate New Orleans and Louisiana. 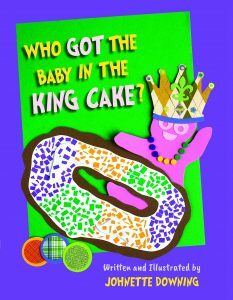 Based on a song from Johnette Downing's new album Swamp Romp, A Louisiana Dance Party for Children, this rhythmic original story celebrates king cake, the culinary centerpiece of New Orleans Mardi Gras. Believed to have originated in twelfth-century France, the king cake is an homage to the wise men or three kings. At king cake parties in New Orleans, usually hosted before Mardi Gras parades, you will hear locals ask, "Who got the baby in the king cake?" Beautiful, colorful, cut fabric illustrations accompany this joyous book designed to entertain and educate kids of all ages. Written and illustrated by Johnette Downing. About Johnette - A New Orleans multi-award winning musician, singer and author presenting Louisiana Roots concerts and author visits for children, as well as keynotes and workshops for educators globally, Johnette is dedicated to celebrating childhood, nurturing cultural exchanges and fostering literacy through her music and books. Downing has garnered multiple awards including a 2017 Louisiana Writer Award, 59th Grammy Award Participant, eight Parents’ Choice Awards, and many more. 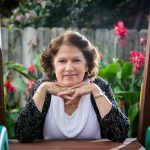 She has written and illustrated dozens of books for children. The big day has arrived, and the youngest riders in the Mardi Gras Day parade are ready to share their beads and trinkets with the children of New Orleans. But as they prepare to start the parade, their float falters and breaks a wheel. Will the children be able to work together to bring the magic of Mardi Gras to the Crescent City? 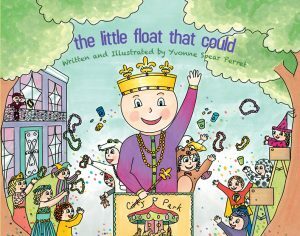 In this Louisiana adaptation of The Little Engine That Could, the children must work together and ask for assistance from other floats as they try to celebrate the spirit of the day. Perret captures the hopes and fears of the children as they prove that even the smallest riders can have the biggest spirit. The illustrations add the glittering sights of the season through bright decoration, highlighting the traditional Carnival colors of purple, green, and gold. The book is completed with a glossary of Carnival- and costume-themed terms. 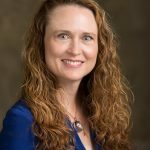 About Yvonne - A graduate of Tulane University, Perret taught at St. Joseph Academy, St. Angela Merici and Mount Carmel Academy. She retired in 2008 from Isidore Newman School in New Orleans after 13 years. While at Newman, Perret taught math and English and also served as interim principal of the high school from 2007-08. She is also the author of Simon of New Orleans and Yat Wit - Chicken Gumbo for the New Orleans Soul.